InfluencerUpdate.biz has teamed up with esports and streaming analytics firm Stream Hatchet to bring you weekly charts of the most popular games in the streaming space. 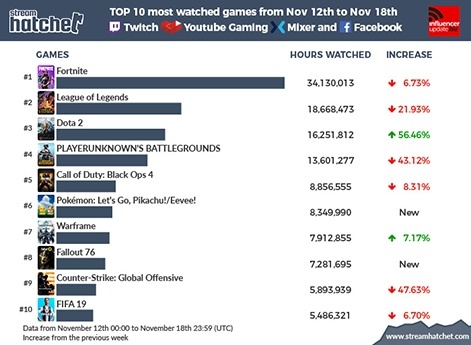 This chart documents the most watched games by hours across Twitch, YouTube Gaming, Mixer and Facebook. Each week we'll be documenting the top ten most watched titles across all the major streaming platforms, so you can see which games are thriving among content creators and which titles are waning in popularity. We also have a chart documenting the week's biggest content creators. This chart covers the week commencing November 12th to November 18th. Fortnite leads the chart again this week, but the giant is still falling slowly. Epic's battle royale builder lost another 6 per cent of its views this week. PUBG takes fourth place, but not without a 43 per cent decrease in views since last week. Call of Duty: Black Ops 4 is up one place to fifth, but has still experienced an 8 per cent decrease. 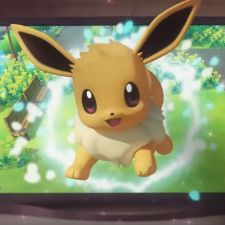 A new entry at six is Pokémon Lets Go Pikachu/Eevee. Nintendo's highly anticipated Pokémon effort dropped this week and racked up 8.3 million hours watched across streaming platforms this week. Warframe takes seventh place for a second week running, as well as a 7 per cent increase in views since last week. Another new entry at number eight with Fallout: 76. Bethesda's open world take on the popular RPG title drummed up 7.2 million views in its launch week. CS:GO falls to ninth place after a 47 per cent decrease in views, and FIFA 19 is still clinging on in tenth place after a 6 per cent drop in views.